What I like about Tharman Shanmugaratnam’s Inclusive Prosperity talk at the London School of Economics (30 Jan) is that it was not reported in the Straits Times. As a newspaper of record, I would have thought it would report the Deputy Prime Minister’s speech outlining his vision for the future of Capitalism. 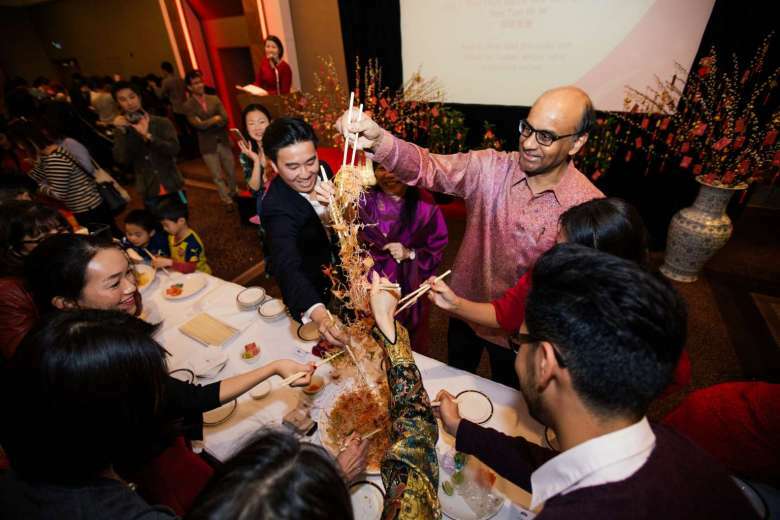 The Government-friendly Straits Times on-line chose instead to feature him tossing Chinese New Year yu-sheng (salad) at a Singapore High Commission event in London. Inclusive Prosperity is a broad political concept developed in the West in response to the rising income inequality and discontent. At the radical end is the call for a Robin Hood Tax on very rich individuals, corporations, or industries and a tax on lucrative transactions in the financial market to equalize income disparity within society, and between nations. Proponents of Inclusive Prosperity included Bill Clinton and Tony Blair who promoted the politics of the Third Way believing that the free market alone could not bring about shared prosperity; and for society to be successful, prosperity must be broadly shared. The World Bank had also taken a lip service interest in Inclusive Prosperity. While some on the left criticize such initiative as a way to save Capitalism, others see it as a half way house between capitalism and socialism. Hence in the first 40 minutes of Tharman’s speech, I thought he was pitching to establish himself as the new messiah to solve the problems plaguing western capitalism. His speech was well researched, and he covered the current political landscape in the West where voters rejected the status quo in favour of popularism as evidenced in the election of Trump, and the referendum in favour of Brexit. Tharman dismissed both the ideologies of the neoliberal market fundamentalism, and the distributive model of social democracy. His version of the Third Way was to empower the working people with new skills through active state intervention in training, and investments in local communities. The substance of his speech was not new. However, his ability to repackage the information, sprinkled with his impressive Singapore experiences and observations of practices in other counties, and delivered in an evangelical tone, – it was indeed impressive and inspirational. Only when he was about to conclude his speech that I realized his intended audience might not be those in the LSE lecture theatre. It was as though he was at a rally at the Padang before a few hundred thousand. It sounded like Tharman rolling up his sleeves, raising his colours on the mast, pitching to become the next Prime Minister of Singapore! That was truly rousing stuff. Heaven has arrived. I paused to think, as ringing in my ears were “it was always about individual effort, hard work, thrift, responsibility”. Tharman was talking about “responsibility reinforcing personal and family responsibility .” Where is the inclusive part of the Prosperity? I replayed his speech searching for any comforting clues that resemble some form of Robin Hood tax or equalizer. Then came the anti-climax: “If you stick purely to a redistributive model it is not going to offer hope, you see more of the same and the true hope comes from enabling individuals to develop their capabilities to the maximum”. Pause, I did not hear any hint of “to all his needs“. Was it dejavu? I thought it reminded me of Lee Kuan Yew’s blast against any form of welfare. Hard work and more hard work even after you retire is nothing new to Singaporeans. But hard work does not necessarily deliver personal prosperity when wages are suppressed by the indiscriminate policy of importing cheap foreign labour, and the absence of a minimum wage. This is Singapore’s existential reality. If hard work and meritocracy are the ultimate social equalizers, I wonder why when 80% of the population lives in public housing, only 40% of the places in top schools are occupied by children from housing estates? Tharman’s emphasis on family responsibility is disappointing as in practice it meant shifting the onus of helping the working, and the retired poor from the State to their families. Using “family responsibility” as a tool to achieve “inclusive prosperity” is politically questionable because that is the State’s defence mechanism from blame. Urging just about managing families to help the poor in their midst is certainly not within the contemplation of those in the West who advocated Inclusive Prosperity. Placing the onus on the family is institutionalizing poverty. It is not lack of hard work, or absence of thrift which is the cause of poverty in Singapore. This is the outcome of past and present policies of the Singapore government. This is the thesis of Yeoh Lam Keong, the retired Chief Economist of the Singapore GIC. He is also a buddy of Tharman since his school days and at the London School of Economics. It is interesting to contrast Tharman’s version of LKY-inspired Social Compact – Mark II, with Yeoh Lam Keong‘s New Social Compact for Singapore which would require more active State fiscal intervention. In his 2015 lectures, Lam Keong had argued that while such fiscal intervention was affordable to Singapore, it was ideologically unacceptable to the ruling PAP. One wonders whether Tharman would contemplate dropping his PAP ideological baggage to support Lam Keong’s New Social Compact. Clearly for there to be any “Inclusive Prosperity”, there needs to be a spirit of inclusive politics. That in fact was the premise of those who first advocated the concept of Inclusive Prosperity because political democracy is meaningless without a fair distribution of wealth. Should individuals and civil societies now take on Tharman’s challenge? For that to happen, Tharman must firstly persuade the Straits Times to publish his speech, Yeo Lam Keong’s alternative New Social Compact, and, probably even this article of mine. Next, Tharman must ensure that all public spaces including those at the Peoples’ Association are inclusive public spaces where unencumbered political debates could take place. Without inclusive politics, there can be no inclusive prosperity. Tharman knows this, and should act on it. This may be what it takes to become the next Prime Minister.